Concert Tour – Mysterium Tremendum by Mickey Hart Band. Former Grateful Dead member Mickey Hart has always been an artist identified by his progressive music, both as a percussionist for the iconic Grateful Dead band, along with his 3 time GRAMMY® Award-Winning albums, and innovative sound excursions with his group the Mickey Hart Band. The Mickey Hart Band “Above The Clouds Concert Tour” in 2012 is underway, with concert reviews for the bands performances getting admirable music reviews for their giant leap into progressive new sounds that becomes somewhat problematic when you try to categorize or brand his music. 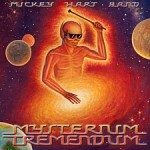 Mysterium Tremendum is the Mickey Hart Band’s new album in 2012. Call it progressive rock, pop, adult contemporary, new age, world, or whatever you like, but identical to their new Mysterium Tremendum release, The Mickey Hart Band’s music is unlike anything you have previously heard. There is a variety of innovative sounds matched with great instrumentals and vocals. During the Mickey Hart Band Tour – 2012, they perform a number of songs from their fantastic new album Mysterium Tremendum, just released on April 10, 2012. It’s a great album that shines by a contrasting fusion of music genres during every one of the 12 songs total. Possessing deep percussions, vocals and heavy rhythms, the divergent mix is extraordinary. Can you envision the Mickey Hart Band will be among those in the New Age or World music categories in the GRAMMY® Awards in 2013? If there were an innovative music category, the Mickey Hart Band would definitely be the winner! Mickey Hart is a constantly evolving musician with no final conclusion in sight for the former Grateful Dead drummer who has been inducted into the Rock and Roll Hall of Fame, and earned the Grammy Lifetime Achievement award. Band members are; Mickey Hart, Crystal Monee Hall, Tim Hockenberry, Dave Schools, Gawain Mathews, Sikiru Adepoju, Ian “Inkx” Herman and Ben Yonas. 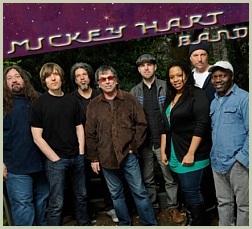 The YouTube song sample video below is live music from the Mickey Hart Band Concert Tour. Visit MickeyHart.net to sample or purchase Mysterium Tremendum, and check out the band’s 2012 Concert Tour schedule. Special VIP packages are also available. Below is the current Mickey Hart Band 2012 Concert Tour schedule for 2012. Please note concert dates shown below are subject to change, and more concert dates may be scheduled once confirmed. For concert updates and most accurate concert info visit MickeyHart.net tour page. Photos are courtesy mickeyhart.net. Visit MickeyHart.net Concert Shows Page for future schedule updates.